CenturyLink, Inc. is an American telecommunications company, headquartered in Monroe, Louisiana, that provides communications and data services to residential, business, governmental, and wholesale customers in 37 states. A member of the S&P 500 index and the Fortune 500, the company operates as a local exchange carrier and Internet access provider in U.S. markets and is the third-largest telecommunications company in the United States in terms of lines served (behind AT&T and Verizon) and provides long distance service. CenturyLink also serves global enterprise customers across North America, Latin America, EMEA and Asia Pacific. The earliest predecessor of CenturyLink was the Oak Ridge Telephone Company in Oak Ridge, Louisiana, which was owned by F. E. Hogan, Sr. In 1930, Hogan sold the company, with 75 paid subscribers, to William Clarke and Marie Williams, for $500. They moved the switchboard to the Williams family front parlor. In 1946, the Williams' son, Clarke McRae Williams, received ownership of the family's telephone company as a wedding gift. In 1947, Clarke Williams learned the telephone company in Marion, Louisiana was for sale. With a loan from business associate Joe Sydney Carter, Clarke purchased the Marion Telephone Company and eventually made it his base of operation as he grew his company through more acquisitions. CenturyLink still maintains offices in the former headquarters building. The company remained as a family-operated business until it became incorporated in 1968. By 1967, Oak Ridge Telephone Company served three states with 10,000 access lines. That year, the company was incorporated as Central Telephone and Electronics. Clarke M. Williams served as president and chairman of the board. Between 1972 and 1975, Clarke gradually moved his headquarters from Marion to Monroe, Louisiana, to access the larger employee base and to be near the airport. In 1971, the company was renamed as Century Telephone Enterprises, Inc. In 1972, Century Telephone acquired the La Crosse Telephone Corporation, of Wisconsin. On October 24, 1978, Century Telephone moved to the New York Stock Exchange for the first time and began to trade under the ticker symbol CTL. Century Telephone performed well during the long bear market of the 1970s, as its stock rose over fourfold. The company provided telephone service in parts of 14 states by that time. In 1981, Century Telephone acquired War Telephone in West Virginia. In 1982, Century Telephone's earnings peaked at $14 million, then declined in 1983 following the early 1980s recession, and finally began to recover in 1984. However, the 1983 decline led to a loss of half the value of the company's stock in 1984. In 1985, both earnings and the stock price had recovered to new record highs. But by then, the company had accumulated $206 million in long-term debt. Century Telephone sold the operations of War Telephone and two other companies to Colonial Telephone for $4.66 million. In 1987, the stock price nearly doubled from its low that year, and from its old 1982 record high, before falling back by a third in the 1987 stock market crash. Earnings had steadily grown each year from their 1983 low, and by 1987 reached nearly US$20 million. In 1989, Century Telephone Enterprises acquired Universal Telephone, Inc. for US$90 million in cash. During the late 1980s the company began a long trend in which it performed extremely well. The stock split three-for-two twice in this period, as earnings steadily grew, through the 1990-1991 recession, and by year-end 1991, they reached nearly US$40 million, double from what they had been in 1987. In 1992, Century Telephone acquired Central Telephone Company of Ohio, a Centel subsidiary, for $135 million. The acquisition served more than 65,000 access lines, and added 20% to Century's access line total. Also that year Glen F. Post III became Chief Executive Officer and, named Vice Chairman of the Board of Century Telephone. In 1993, Century Telephone revenues were over $425 million, up from about $350 million in 1992. 1993 earnings were nearly $80 million, up from about $70 million in 1992, excluding a nearly $16 million charge in 1992 due to the cumulative effect from an accounting change that year. Also in 1993 the company split its stock three-for-two yet again. However, by that time, the company had accumulated nearly $520 million in long-term debt. By 1995, Century Telephone Enterprises had been added to the S&P MidCap 400 index. Earnings had continued their steady growth trend through the 1994 economic soft landing, and by 1995 they reached over US$115 million. But the long-term debt continued to grow as well, reaching US$623 million that year. In 1997, Century Telephone acquired Delta Security Alarm Co., Inc. of Monroe, Louisiana, and its largest acquisition up until that time, Pacific Telecom, doubling its size with 660,000 additional telephone access lines in 12 states. Pacific Telecom, Inc., would continue existence and was renamed CenturyTel of the Northwest, Inc. In 1998, Century Telephone split its stock three-for-two once again. The company acquired another Monroe, Louisiana security company, Century Protection Systems, and also acquired 89,000 access lines and 19 exchanges in 21 northern Wisconsin communities from Ameritech. The affected customers had formerly been served by Wisconsin Bell. Ameritech's directory publishing operations serving those customers were also acquired. In 1999, the company was renamed as CenturyTel, Inc. It split its stock three-for-two once more, and was added to the Standard & Poor's 500 Index that year. In 2000, CenturyTel acquired 230,500 GTE lines in Arkansas, and also bought 127,000 GTE lines in Missouri in partnership with Spectra Communications. In Wisconsin, it acquired 133,000 additional lines, and 70,500 access lines for US$195 million from Verizon. That year CenturyTel also bought 62,650 lines for US$170 million in partnership with Telephone USA of Wisconsin, LLC. In 2001, CenturyTel acquired CSW Net, Inc. of Russellville, Arkansas, and fended off a hostile take-over attempt by ALLTEL, Inc. In 2002, the son of the company's original founder and Chairman of the Board Clarke M. Williams died. He was succeeded by then Vice Chairman Glen F. Post III. The company sold its wireless business to ALLTEL, to become a pure-play rural local exchange carrier. Also that year CenturyTel acquired 300,000 Verizon access lines in Alabama, and 354,000 Verizon access lines in Missouri, bringing its total operations to 22 states with 2.5 million access lines. In 2003, CenturyTel acquired half ownership of SkyComm International, Inc. in Houston, Texas, in March, to form a satellite teleport for its global Network Access Point (NAP) system. In June, CenturyTel also acquired the fiber network of Digital Teleport, Inc., a 5,700-mile (9,200 km) route running from Illinois to Texas, and adjoining states. CenturyTel renamed the network company LightCore. Closing out the year, in December CenturyTel acquired the Midwest Fiber Optic Network (MFON) from Level 3 Communications, Inc. in December, a stand-alone system in the same core central states as LightCore. In August 2004, it partnered with EchoStar Communications Corporation for DISH Network multi-channel digital TV. In September, CenturyTel began a relationship with Cingular Wireless. In 2005, CenturyTel began a wireless voice and data service, and bought a number of fiber networks in the central United States, from KMC Telecom Holdings, Inc. In 2006, CenturyTel sold its Arizona assets to Hopi Telecommunications, Inc., bringing total operations to 23 states. In May 2007, CenturyTel acquired Madison River Communications, based out of Mebane, NC and parent company to four LECs (AL, GA, IL, and NC) as well as CLEC operations in IL, LA, and NC. The LECs included Mebtel Communications, a telephone company serving Alamance County, North Carolina; GulfTel Communications, based out of Foley, AL and serving Baldwin and surrounding counties; Coastal Communications, based out of Hinesville, GA; and Gallatin River Communications, serving the Dixon, Galesburg, and Pekin areas of IL. In late 2007, the Customer Respect Group, an international research and consulting firm that focuses on how corporations treat their online customers, ranked CenturyTel the best among six leading communications providers. On October 27, 2008, Embarq announced that it would be acquired by CenturyTel, Inc. in an all-stock transaction valued at about $6 billion. CenturyTel's CEO Glen Post would remain CEO of the merged company following the acquisition, and remained CEO as of 2018. Embarq was the former landline business of Sprint and served cities in 18 states, including Nevada, Florida, North Carolina and Ohio. The deal made CenturyTel the third-largest landline phone provider in Pennsylvania behind Verizon (through both Verizon Pennsylvania and Verizon North) and Comcast. On June 2, 2009, a press release announced that the combined CenturyTel/Embarq entity would be called CenturyLink. Denver-based Monigle Associates was retained to formulate the new brand strategy. The acquisition was completed on July 1, 2009. On October 19, 2009, CenturyTel and Embarq brandings were retired, and all business was officially conducted under the CenturyLink banner, continuing to trade on the NYSE under the CenturyTel stock ticker CTL. The new corporate name, CenturyLink, Inc., did not become official until May 2010. On April 22, 2010, CenturyLink (at this point still legally known as CenturyTel, Inc.) announced it would acquire Qwest in a stock-for-stock transaction. Under the agreement, CenturyLink would swap 0.1664 of its shares for each share of Qwest; as a result, CenturyLink shareholders prior to the merger wound up with 50.5% share of ownership in the combined company, while former Qwest shareholders gained the remaining 49.5%. The valuation of CenturyLink's purchase was $12 billion. The merger was completed on April 1, 2011. The addition of Qwest allowed CenturyLink to become the third largest telecommunications company in the United States, and the largest landline phone provider in the state of Colorado. The new company has 17 million access lines, 5 million broadband customers, and 1.4 million video subscribers across 37 states. The merger also made CenturyLink owner of one of the so-called Baby Bells: Qwest included what was once US West, the Baby Bell for much of the western United States. On July 15, 2011, CenturyLink acquired Savvis, Inc., a global provider of cloud infrastructure and hosted IT solutions for $2 billion, which represented all outstanding shares of Savvis common stock at $40 per share. This acquisition allowed CenturyLink to provide expanded managed hosting and cloud services. On December 4, 2012, CenturyLink launched an integrated suite of cloud services called savvisdirect. Savvisdirect was an expansion of CenturyLink’s portfolio of Savvis cloud services and includes cloud application hosting, cloud servers, cloud storage, and private cloud for small businesses, IT administrators and developers. CenturyLink later shuttered the savvisdirect subsidiary, consolidating their cloud service offerings internally. On October 16, 2012 Savvis acquired ITO Business Division of Ciber thereby adding managed services to the portfolio. On June 14, 2013, CenturyLink announced the acquisition of AppFog, a Portland-based Platform as a Service used by over 100,000 developers to automate the deployment of software on public clouds such as Amazon Web Services and OpenStack. On November 19, 2013, CenturyLink announced the acquisition of Tier 3, a Seattle-based infrastructure as a service (IaaS), platform, and advanced cloud management company based on Cloud Foundry. On December 8, 2014, CenturyLink announced the acquisition of DataGardens, Inc., a Disaster Recovery as-a-Service (DRaaS) provider based in Edmondton, Alberta, Canada. On December 11, 2014, CenturyLink announced the acquisition of Cognilytics, a predictive analytics and big data solution provider. On March 30, 2016, CenturyLink announced the acquisition of netAura, a security services company that focuses on cybersecurity, security information and event management (SIEM), analytics and vulnerability management. On October 31, 2016, CenturyLink announced its intent to acquire Level 3 Communications in a deal valued at around $25 billion.. After securing the necessary regulatory approvals, CenturyLink closed the transaction on November 1, 2017. CenturyLink offers voice and data communications, as well as television and home security services. CenturyLink's local and long distance voice communications is POTS. CenturyLink's data communication is through DSL, Metro Ethernet, MPLS, ATM, and Frame Relay over fiber optics, copper DS-3 and T-1 lines. The company also offers bundling with Verizon Wireless. CenturyLink offers a fiber-optic based IPTV service named Prism TV in select markets. In areas where Prism TV is not available, CenturyLink partners with DirecTV. CenturyLink formerly offered Dish Network bundles to their customers, a remnant from the company's days before its acquisition of Qwest. In May 2014, CenturyLink reported that it had nearly 200,000 Prism TV subscribers. 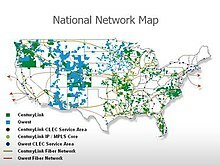 CenturyLink Fiber is a fiber to the premises service in the United States, providing broadband Internet and Prism TV to a small and very slowly growing number of locations. The service was first introduced to Omaha, Nebraska, and next rolled out to Las Vegas, Nevada, with plans for expansion to several other markets. Unlike the company's existing high speed Internet deployments, which utilize fiber-to the node/neighborhood to increase the speed of ADSL2+ speeds up to 20/2 Mbit/s, Vectored VDSL2+ speeds up to 140/10Mbit/s, in these markets CenturyLink now installs their fiber optic cable all the way to the home or business with speeds up to 1,000 Mbit/s download and 1,000 Mbit/s upload using Calix Optical Network Terminals. On Feb. 2, 2014, CenturyLink announced the availability of Gigabit fiber service to multi-tenant businesses in Salt Lake City and surrounding communities. On Aug. 5, 2014, CenturyLink announced the expansion of its gigabit fiber service to 16 additional markets. On Sep, 15, 2015, CenturyLink announced the expansion of its gigabit fiber service to residential and business customers in six additional states, increasing the company's service coverage to select areas of 17 states. On May 2, 2017 CenturyLink, Inc. completed the previously announced sale of its data centers and colocation business to funds advised by BC Partners, in a consortium including Medina Capital Advisors and Longview Asset Management. The deal was worth approximately $1.86 billion with CenturyLink retaining an approximately 10% equity stake in the consortium's newly formed global secure infrastructure company, Cyxtera Technologies. The Federal Communications Commission ordered CenturyLink to pay a record $16 million for failing to alert authorities of a preventable programming error that left nearly 11 million people in seven states without access to emergency services for six hours in 2014. In December 2018, CenturyLink attracted criticism after employing DNS hijacking to display an advertisement for its security and parental control software to residential subscribers in Utah, with service disrupted to users until they read and acknowledge the advertising. CenturyLink stated that the message was presented to comply with a recently-enacted Utah state law, requiring ISPs to inform users "of the ability to block material harmful to minors". Bill sponsor and Utah State Senate member Todd Weiler stated that the law did not require that service be disrupted until the notice is acknowledged; the law only requires that this notice be delivered in a conspicuous manner, and suggested manners such as inclusion in a monthly bill. On December 27th, 2018, a “nationwide outage” caused 9-1-1 service to be disrupted across the country. The Federal Communications Commission says it will investigate. In some areas the outage lasted nearly twelve hours and was the third shutdown of the year following outages in April and November 2018. ATM and point of sale credit card machines were also widely affected. ^ "CenturyLink CEO Glen Post to retire in May effective on date of CenturyLink's 2018 Annual Shareholders' Meeting". CenturyLink. 2018-03-06. Retrieved 2018-05-23. ^ a b c d e "CenturyLink Inc. 2017 Annual Report (Form 10-K)". Centurylink Inc. Retrieved 1 April 2018. ^ "CenturyLink completes acquisition of Level 3". ^ "CenturyLink Overview and Coverage". broadbandnow.com. Retrieved 2015-06-02. ^ "CenturyLink". Fortune. Retrieved 2018-11-21. ^ "CenturyLink Company Profile". Telecom Carrier Updates. Retrieved 20 March 2012. ^ "Global Leader in Enabling Digital Businesses | CenturyLink". www.centurylink.com.sg. Retrieved 2019-03-11. ^ Simmons St (1970-01-01). "1000 Simmons St Marion, LA - Google Maps". Google Maps. Retrieved 2013-12-20. ^ a b Brown, Gil. "A Look At The Telecommunications Industry: The Best of The Independent Phone Companies". Hedge-hog.com. Archived from the original on 2007-09-28. ^ "Public Service Commission of West Virginia". Retrieved 2013-12-20. ^ "Centurylink Inc, Form 8-K, Current Report, Filing Date Dec 3, 1998". secdatabase.com. Retrieved Mar 22, 2013. ^ "Centurylink Inc, Form 10-K, Annual Report, Filing Date Mar 16, 1999". secdatabase.com. Retrieved Mar 22, 2013. ^ "CenturyLink Inc, Form 8-K, Current Report, Filing Date Aug 25, 1999". secdatabase.com. Retrieved Mar 22, 2013. ^ "CenturyLink Inc, Form 8-K, Current Report, Filing Date Aug 15, 2000". secdatabase.com. Retrieved Mar 22, 2013. ^ "CenturyLink Inc, Form 8-K, Current Report, Filing Date Oct 5, 2000". secdatabase.com. Retrieved Mar 22, 2013. ^ "CenturyLink Inc, Form 10-K, Annual Report, Filing Date Mar 22, 2001". secdatabase.com. Retrieved Mar 22, 2013. ^ "CenturyLink Inc, Form 8-K, Current Report, Filing Date Aug 15, 2001". secdatabase.com. Retrieved Mar 22, 2013. ^ "CenturyLink Inc, Form 8-K, Current Report, Filing Date Oct 8, 2002". secdatabase.com. Retrieved Mar 23, 2013. ^ "CenturyLink Inc, Form 10-K, Annual Report, Filing Date Mar 27, 2003". secdatabase.com. Retrieved Mar 23, 2013. ^ "CenturyLink Inc, Form 10-K, Annual Report, Filing Date Mar 16, 2005". secdatabase.com. Retrieved Mar 23, 2013. ^ "CenturyLink Inc, Form 8-K, Current Report, Filing Date Aug 27, 2004". secdatabase.com. Retrieved Mar 23, 2013. ^ "CenturyLink Inc, Form 8-K, Current Report, Filing Date Sep 21, 2004". secdatabase.com. Retrieved Mar 23, 2013. ^ "CenturyLink Inc, Form 8-K, Current Report, Filing Date Jul 5, 2005". secdatabase.com. Retrieved Mar 23, 2013. ^ "CenturyLink Inc, Form 8-K, Current Report, Filing Date Dec 20, 2006". secdatabase.com. Retrieved Mar 23, 2013. ^ "CenturyLink Inc, Form 8-K, Current Report, Filing Date May 3, 2007" (PDF). secdatabase.com. Retrieved Mar 23, 2013. ^ "at". Baldwinnewsnow.com. Archived from the original on 2011-08-12. Retrieved 2012-05-15. ^ "GulfTel changing name to CenturyTel —". Baldwinreport.com. 2008-04-11. Retrieved 2012-05-15. ^ a b c "CenturyLink to Buy Level 3 Communications for $25 Billion". Wall Street Journal. Retrieved November 4, 2016. ^ a b "Centurylink Inc, Form 8-K, Current Report, Filing Date Jun 4, 2009". secdatabase.com. Retrieved Mar 22, 2013. ^ "CenturyLink Inc, Form 8-K, Current Report, Filing Date Oct 27, 2008" (PDF). secdatabase.com. Retrieved Mar 23, 2013. ^ a b Harden, Mark (8 August 2015). "CenturyLink to cut 1,000 jobs; Colorado impact unclear". Denver Business Journal. Retrieved 2015-08-10. ^ a b "Timeline". CenturyLink. Retrieved 2013-12-20. ^ "CenturyLink Inc, Form 8-K, Current Report, Filing Date Jun 4, 2009" (PDF). secdatabase.com. Retrieved Mar 23, 2013. ^ "Centurylink Inc, Form 8-K, Current Report, Filing Date Jul 1, 2009". secdatabase.com. Retrieved Mar 22, 2013. ^ "CenturyLink Inc, Form 8-K, Current Report, Filing Date Apr 27, 2010" (PDF). secdatabase.com. Retrieved Mar 23, 2013. ^ "CenturyLink to buy Qwest for $10.6 billion in stock". Washington, DC: MarketWatch. 2010-04-22. Retrieved 2010-04-22. ^ "Centurylink Inc, Form 8-K, Current Report, Filing Date Apr 6, 2011". secdatabase.com. Retrieved Mar 22, 2013. ^ "CenturyLink completes $12.2 billion acquisition of Qwest". Komonews.com. 2011-04-01. Retrieved 2013-12-20. ^ Higginbotham, Stacey (2010-04-22). "CenturyTel to Buy Qwest for $22.4 Billion". GIGAOM. Retrieved 2010-04-22. ^ "CenturyLink Inc, Form 8-K, Current Report, Filing Date Jul 15, 2011" (PDF). secdatabase.com. Retrieved Mar 23, 2013. ^ Akins, Lance. "Centurylink and Savvis Complete Merger". Telarus Industry News. Retrieved 11 July 2011. ^ "CenturyLink gives businesses simple, affordable cloud services with the U.S. launch of savvisdirect - Dec 4, 2012". News.centurylink.com. 2012-12-04. Archived from the original on 2013-12-20. Retrieved 2013-12-20. ^ "Cloud Applications Marketplace". savvisdirect. Retrieved 2013-12-20. ^ "Servers - CenturyLink Cloud". Savvisdirect.com. Retrieved 2013-12-20. ^ "Cloud Storage, Online Storage, Enterprise Object Storage - CenturyLink Cloud". Savvisdirect.com. Retrieved 2013-12-20. ^ "Cloud Server, Virtual Servers, VPS - CenturyLink Cloud". Savvisdirect.com. Retrieved 2013-12-20. ^ Savvis. "Savvis Completes Purchase of Ciber Global IT Outsourcing Business". www.prnewswire.com. Retrieved 2018-04-26. ^ "Overview". Archived from the original on 2014-02-10. Retrieved 2014-02-25. ^ "CenturyLink acquires Tier 3 to accelerate cloud platform strategy - Nov 19, 2013". News.centurylink.com. 2013-11-19. Archived from the original on 2013-12-15. Retrieved 2013-12-20. ^ "AppFog PaaS to Create and Manage Cloud Native Apps - CenturyLink Cloud". ^ "DataGardens joins CenturyLink, adding proven disaster recovery offering to cloud portfolio - Hybrid Cloud and IT Solutions". ^ CenturyLink. "CenturyLink acquires Cognilytics to extend its IT services, Big Data and advanced predictive analytics capabilities". ^ "CenturyLink acquires IT security services firm netAura". ^ Picker, Leslie (2016-10-31). "CenturyLink, a Network Provider, to Acquire Level 3, a Rival". The New York Times. Retrieved 31 October 2016. ^ "CenturyLink Home Page". CenturyLink. Retrieved 2011-02-01. ^ "Verizon Wireless Service through CenturyLink". Centurylink.com. Retrieved 2013-12-20. ^ "CenturyLink availability by state". HighSpeedInternet.com. Retrieved 2016-07-12. ^ "Prism TV. See Why It's Better Than Cable. - CenturyLink". CenturyLink - Prism. ^ "CenturyLink Partners With DIRECTV". 2010-08-05. Retrieved 2011-02-01. ^ "CenturyLink Reports Strong First Quarter 2014 Results". ^ "CenturyLink rolling out Prism TV in Chandler, Gilbert". Phoenix Business Journal. Retrieved 2013-05-22. ^ CenturyLink. "CenturyLink receives franchise approval to expand Prism TV service into metro Denver". ^ "CenturyLink starts offering its Prism TV in parts of county". The Gazette. Retrieved 2013-05-22. ^ "CenturyLink Launches Prism TV in Highlands Ranch". CenturyLink Newsroom. Retrieved 2013-11-19. ^ "CenturyLink gives Prism™ TV customers anywhere access to live TV programming". FierceCable. ^ "CenturyLink Offers New Functionality to Prism TV Users". 2012-01-27. Retrieved 2012-02-25. ^ CenturyLink. "CenturyLink launches Prism™ TV in Portland". ^ "CenturyLink takes on Comcast in Seattle with rival Prism TV". The Seattle Times. 18 August 2015. Retrieved 29 October 2015. ^ "CenturyLink Beefs Up Prism TV App Lineup". ^ "CenturyLink will expand ultra-fast 1-gigabit Internet service in Omaha, Vegas; roll it out in 14 other cities". Omaha.com. 2014-08-05. Retrieved 2016-01-30. ^ KRISTY TOTTEN LAS VEGAS REVIEW-JOURNAL. "CenturyLink launches 1 Gbps Internet service in Las Vegas". Las Vegas Review-Journal. ^ "CenturyLink's Ewing: We're evaluating other areas for FTTH". FierceTelecom. ^ "Situs Judi Online - Situs judi online terbaik yang pernah ada di Indonesia". ^ "CenturyLink - Omaha HSI and TV Services Upgrade". ^ CenturyLink. "CenturyLink expands its gigabit service to 16 cities, delivering broadband speeds up to 1 gigabit per second". ^ CenturyLink. "CenturyLink positioned as an industry leader in residential gigabit deployment". ^ CenturyLink. "CenturyLink brings residential gigabit service to select areas of Phoenix metro, delivering fiber-enabled broadband speeds up to 1 gigabit". ^ CenturyLink. "CenturyLink brings residential gigabit service to select areas of the Triangle, delivering fiber-enabled broadband speeds up to 1 gigabit". ^ CenturyLink. "CenturyLink expands gigabit service to La Crosse, delivering fiber-enabled broadband speeds up to 1 gigabit per second". ^ Vuong, Andy (2013-01-03). "CenturyLink shuffles operating model, will pick new Colorado president". Denverpost.com. Retrieved 2013-12-20. ^ "CenturyLink Announces Regional Operating Structure". News.centurylink.com. November 30, 2010. Archived from the original on November 1, 2013. Retrieved 2013-09-04. ^ a b c d e f g h i j k l m n o p "CenturyLink | Sponsorships". www.centurylink.com. Retrieved 2016-04-26. ^ "FCC Fines CenturyLink $16M, Intrado Communications $1.4M For Actions During Massive 911 Outage". 6 April 2015. ^ Brodkin, Jon (2018-12-17). "CenturyLink blocked its customers' Internet access in order to show an ad". Ars Technica. Retrieved 2018-12-19. ^ "Nationwide CenturyLink outage impacting 911 cellphone calls in Massachusetts". ^ Gallup Independent (December 29, 2018). "Time to create an ancillary internet network". Gallup Independent. p. 4. Wikimedia Commons has media related to CenturyLink.